There is only one stadium in the country where you will find a replica pirate ship! If you guessed Raymond James Stadium you are correct. As an expansion franchise, the Buccaneers spent their first 21 seasons at Houlihan Stadium. When owner Hugh Culverhouse died in 1994 the future of the Buccaneers was uncertain. Groups in cities including Baltimore, Orlando, St. Louis, and Toronto wanted to buy the franchise to relocate the team. However, Malcolm Glazer purchased the team in 1995 and demanded that a new stadium be built for the Buccaneers. After the team was unsuccessful in selling charter seats in a campaign to fund a new stadium it appeared that the team may move to Cleveland to replace the Browns who had moved to Baltimore. However, in October 1996 Hillsborough County voters approved a referendum to construct a stadium for the Buccaneers in Tampa. 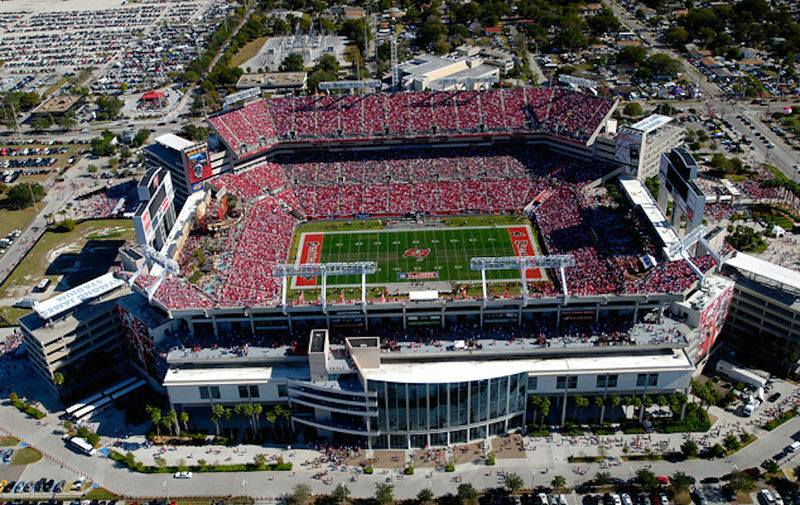 The Buccaneers wanted a combination of the finest elements of modern stadium design and its own groundbreaking innovations in a new stadium. Construction began adjacent to Houlihan Stadium in October 1996. 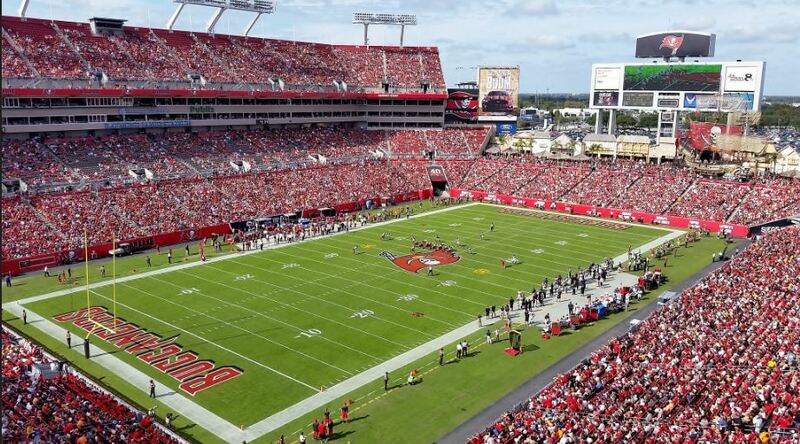 Raymond James Financial of Tampa, purchased the naming rights for 13 years. The stadium was named Raymond James Stadium. Warren Sapp wins Defensive Player of the Year in 1999. On September 20, 1998, the Buccaneers played their inaugural first game at Raymond James Stadium, against the Chicago Bears. It was an exciting, anticipated event as over 65,000 fans filled the stadium. Two, three tier grandstands are located on both sides on the playing field, and additional seating is located past both endzones. Raymond James Stadium’s features are centered around one concept: enhancing fans experiences at a Tampa Bay Buccaneers games. The stadium has many amenities including 12,000 club seats, 195 luxury suites and the main feature, Buccaneer Cove. Located beyond the north endzone at Raymond James Stadium, Buccaneer Cove, is modeled after a 19th century Pirate village. Costing $3 million, Buccaneer Cove’s main attraction is a 103 foot long replica Pirate ship. The ship serves as a entertainment area for fans. Other features of the Cove include a weathered, 2-story fishing village facade from which a wide variety of stadium concessions. Also located throughout the area are a variety of beach hut kiosks offering additional concessions, a 9 foot x 7 foot skull, and other game enhancements. When a Buccaneer player scores a touchdown, eight cannons fire to celebrate the moment. Raymond James Stadium has hosted two Super Bowls, Super Bowl XXXV and XLIII. It is also the home of the Outback Bowl (NCAA) game each year and will host the 2017 college football playoff title game.